Calling all government and public sector bloggers, tweeters, posters and content producers! Written by a senior digital communication professional with over 12-years’ experience working with government clients, this book is designed to provide an easy resource for public sector marketers and communicators. Inside you will find ideas for how to make your content planning easier, what to include in your social media strategy and policies and lots of ideas for content that will work in a civil service, public sector or government setting. 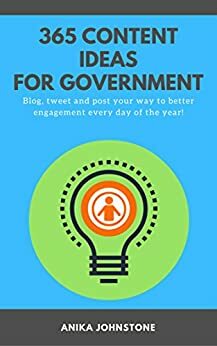 Every idea has been considered and crafted to work specifically for government organisations and takes into account the unique environment of the public sector. You can use across all channels including your blogs, websites, Facebook, Twitter, LinkedIn, Instagram, Pintrest, Snapchat and many more. Easy to read and designed to prompt many more of your own brilliant ideas, this book will become a trusted companion for anyone managing a government brand, blog or online community.